(July 3, 2018) -- Two cybersecurity education games are now available for community input to teach cryptography and cybersecurity principles to middle school students. 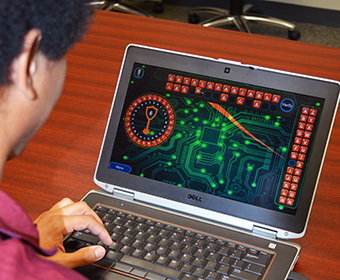 The UTSA Center for Infrastructure Assurance and Security (CIAS) designed the games as part of a National Science Foundation (NSF) Grant to develop effective ways that introduce students to cybersecurity principles through game-based learning platforms. The CIAS is seeking feedback from teachers and players while the games are available in their beta release form through July 31. “In addition to the community’s help in identifying any potential bugs or connectivity issues, we are eager to determine a player’s overall reaction to the games and how well they’ve learned the concepts of transposition ciphers and cybersecurity principles,” said Larry Sjelin, director of game development at the CIAS. Project Cipher is designed to introduce students to the concept of cryptography by showing players techniques for encoding or decoding secret messages, called ciphers. The various levels within the game teach students to identify what type of code is being used and then how to decode that message through an interactive platform. The practical applications of cryptography are far reaching. Many organizations, both locally and abroad, use cryptography to encrypt documents, networks, emails and more. This skill set is also employed by governments, military and businesses. Pyramid of Knowledge is designed as a testing tool to provide educators with the ability to build their own quizzes for use in the Pyramid quiz interface. This online tool supports automated scoring, randomized answer positioning and multiple-choice options. While it functions as a trivia game show that instructors can customize to fit their subject matter, Pyramid of Knowledge is pre-loaded with STEM-focused content in areas of cybersecurity and math. Throughout both games, players earn coins, or points, for successfully completing a section of the game. Coins earned are transferred to the Cyber Threat Defender PC game, which launched on June 5. Coins can be used to access additional cards within Cyber Threat Defender to enhance a player’s card deck to help them defend their networks against cyber attacks. Participate in beta testing or learn more about Project Cipher or the Pyramid of Knowledge.